European legislation requires medical device manufacturers to perform a conformity assessment of their medical devices, before entering the European market.This conformity assessment includes compiling a technical documentation for the medical device, which includes technical specifications, instructions for use, a risk assessment, evidence on biological safety and a clinical evaluation. The clinical evaluation aims at providing sufficient clinical evidence that the medical device will deliver its expected performance and that no safety issues will arise during use. Conformity assessment procedures of the kind are also customary in other parts of the world. Some countries require a market approval, others a more simple registration, with the responsibility of document completeness being left to the manufacturer. If manufacturers operate in various countries and regions, it can be quite a hassle to comply with all the regionally different documentation requirements. Gladly, the Global Harmonization Task Force (GHTF) was put into place in 1992, i.e. almost a quarter of a century ago, with the intention to harmonize the different international requirements. In 2011, the task force has been replaced by a follow-up group called International Medical Device Regulators Forum (IMDRF), which continues to work in the same direction. The idea of harmonization was to put up guidelines that enable easier communication between manufacturers and conformity assessment bodies and to set up rules to streamline documentation requirements — basically in order to merge international requirements into one set of global requirements. These rules were then expected to be used as internationally accepted guidelines. The guideline for Clinical Evaluation Reports was a good example of a successful guideline in the spirit of harmonization. However, the recent update of MEDDEV 2.7/1 revision 4 has somewhat drifted away from this idea and concept. In Europe, conformity assessment for medical devices is to be performed according to the European legal framework that has been completely revised during the last decade and that will enter into force on May 25, 2017. During transition period manufacturers may choose whether to comply with the European Directive 93/42/EEC (or 90/385/EEC for active implantable medical devices) or the new Medical Device Regulation 2017/745. Depending on the chosen route, it will still be possible to bring medical devices to the European Market under the Directive for years, but no later than May 25, 2024. This, however represents a special scenario and the vast majority of products is expected to be recertified no later than five years after the Regulation enters into force. Apart from the European law, the regulatory preconditions for market access include compliance with several international and European standards. As the Directive was not very detailed overall and now and then lacked legal clarity, the European Commission issued more than a dozen guidelines called MEDDEV guidelines that should help the concerned parties to understand legislation and better implement the requirements. These might be replaced or updated over the next years in order to comply with the new Regulation. Looking back: After medical device legislation had been established before the turn of the millennium, the first MEDDEV 2.7/1 guideline for clinical evaluations was put into place. It soon became the gold standard for clinical evaluations and — even though not required by law, but due to lack of adequate legal instructions — it has been regarded as the only reference standard by notified bodies. MEDDEV documents were supposed to be revisable more easily in comparison to the regulations in order to adapt more quickly in cases where misunderstandings of regulations might lead to lack of compliance. A second revision of MEDDEV 2.7/1 was hardly noticed and it was not before 2009, after a major revision of the European legal framework for medical devices, that the MEDDEV guideline was revised as well. The aim of the revision was to achieve compliance with the changes to the medical device directive, but also, to streamline with the approach suggested by the Global Harmonization Task Force. And this was done to a quite extreme extend: The revision 3 of MEDDEV 2.7/1 was basically a copy of the previously published GHTF recommendation for clinical evaluations (including typing errors). The only difference was that there was an extra section about the European Notified Bodies. Harmonization had succeeded — at the price of now having clinical evaluation requirements that used a wording not previously known in Europe and that was strongly influenced by US regulations. It should be noted that, generally, the recommendations made sense. The revised medical device directive made a clearer call for clinical data. Regarding the MEDDEV 2.7/1 this implied: If no sufficient clinical data showing safety and performance of the device are available, a clinical study has to be performed. It needs to be remembered that the revisions were published shortly before the PIP scandal (leaking breast implants) surfaced and the call for stricter regulations quickly became louder and louder. In the years to follow, discussions emerged on how to protect the patient while not impeding innovation in Europe. In consequence, the legal framework was completely redesigned. The new European Medical Device Regulation will most probably have a great impact on manufacturers and conformity assessment bodies in Europe. 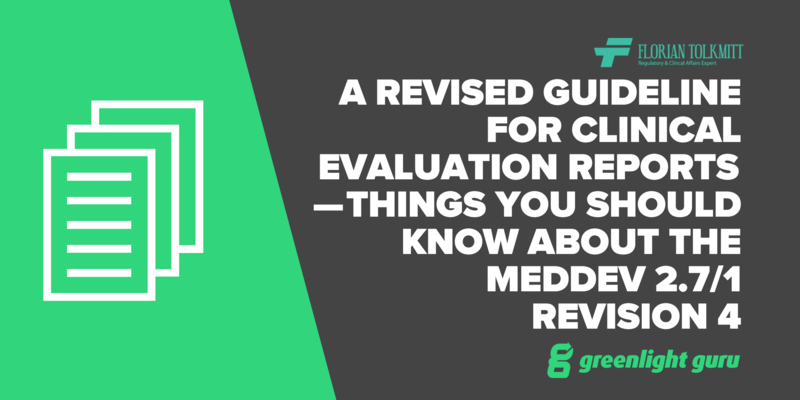 Just about 10 months prior to this, the European Commission issued another revision of the Clinical Evaluation guideline MEDDEV 2.7/1. The revision 4 of this guideline was seen as a foretaste of the Regulation. As a surprise, the new MEDDEV guideline was completely rewritten, not taking into account any previous streamlining with international harmonization approaches. In contrast, it now completely adopts a European perspective. As explained in the following, the guideline makes it harder than ever to show safety and performance of a medical device based on existing clinical data. Just to point this out again: Revision 1 and 2 focused on the interpretation of the European directive and helped to understand the legal requirements. Revision 3 came along to streamline with international requirements and brought harmonization. Revision 4 takes two steps back and focuses again on the European perspective only and also limits clinical data to be used to European data only with only very limited exceptions. To be more precise, the guideline now makes clear limitations in terms of equivalence and the data that may be considered relevant for the clinical evaluation. First of all, equivalence must be proven thoroughly and preferably for a single device only. Clinical equivalence means that the product must be used for the same intended use and patient. Technological equivalence means that the product must underlie the same technological concept, to be proven by technical data in such a depth, that this will almost be impossible for a manufacturer if he does not own the technical documentation of the product — in other words: if he is not the owner of the product. Biological equivalence means that the product must be manufactured with the same materials. Again, this will be hard to prove; at least harder as in the past. In addition to this, the only data that may be considered relevant are data that are collected with CE-marked medical devices. This means, that in order to be able to use data from scientific literature, there must be evidence that the presented data was generated using a CE-marked device. Authors of clinical evaluations will have to develop additional detective-like investigational skills that will help them find information in publications that has never been recorded, such as if the device under investigation was CE-marked, or take the easy way and recommend to do a clinical study due to lack of existing clinical data. Looking back at the call for more clinical studies in the last revision of the Directive that has not actually hit the ground in terms of execution, this indeed might be the intention. When looking further down the road of regulation and taking a glance on the new Medical Device Regulation, it becomes evident that the current revision of MEDDEV 2.7/1 was nothing more than a sneak preview of what will be the new European legal framework. The European market is moving away from harmonization and is encapsulating itself from the rest of the world by imposing the strictest requirements there ever were for medical devices. The medical device manufacturer? At least not the smaller ones as they are not expected to survive the rise of regulations. The bigger ones will survive, but at the cost of having to invest more into market access and consequently a lower ratio in development of new products. The conformity assessment bodies (notified bodies)? Here too, a consolidation is expected to be seen in the next few years. The stronger (and hopefully better) survive, whereas the weaker will shut down. Nonetheless, the number that is relevant for a functioning system is the number of qualified staff that performs audits at the manufacturers. And currently all notified bodies are unable to fill all open positions that are required to maintain a compliant auditing system. At least the notified bodies will most likely not have to complain about lack of work. The user and the patient? Both will be affected. The user will be able to use safer devices on the patient. That is the plan. The open questions are: When will new devices be available, if more clinical studies need to be performed before market access can be obtained? Or even, will all devices that are currently on the market remain there if all of a sudden the clinical data that was used as evidence for safety and performance is not considered valid anymore? And last but not least, will products reach the market if the call for clinical studies makes products more expensive? In many cases, this may be doubtful. Authors of clinical evaluations? Obviously, there will be a strong demand for clinical evaluation reports and updates in the near future. However, only very few of the past authors qualify as future authors due to new and stricter qualification requirements. So the single author will have a hard time to comply with the requirements alone. It can be expected that we will witness a shift from one author to a team of authors, each with specific skills to complement the overall requirements. In the end it might turn out, that even authors will not really be the winners because they may not meet the manufacturers expectations to have a clinical evaluation done without the necessity of a clinical study. So the author’s task may shift from the person that could make the manufacturer happy by providing a scientific evaluation of clinical data to the one, that will have to tell the manufacturer that the clinical data available cannot be used anymore or are not sufficient to proof safety and performance and that performing a clinical study is the only way out. This might become a tremendously unpopular job after all. The CROs. Who if not them will benefit? More clinical studies mean more business. And clinical studies are usually not the smallest kind of business. But even the CROs might run into lack of resources. So as a manufacturer, the run for clinical study slots may start in the near future - if it has not already. Similarly as the notified bodies, the CROs might run into resource problems, not being able to accept all requests from potential clients due to lack of staff. Another — though small — winner may be the provider of a European scientific database called EMBASE. MEDDEV 2.7/1 now requires searches in databases with European data and especially points out that the most widely used database PubMed does not offer this kind of data, whereas EMBASE does. It seems that there is no way around the privately operated database with quite costly fees. In the end, Europeans might not even notice who wins. They simply do their job, request stricter rules for market access and comply with new regulations. This will keep them busy for quite some time. The bottom-line is that the updated MEDDEV 2.7/1 guideline was far more than an interpretation of current European Directives. It was a preview of the Medical Device Regulation that “upgraded” many of the recommendations into law. MEDDEV 2.7/1 therefore remains a helping hand for manufacturers and notified bodies, if seen from the perspective that it provides a smooth transition from nice to have to must have. Learn more about how Greenlight Guru's eQMS Software Platform and QA/RA Services can help you comply with the QMS requirements laid out in the new EU Medical Device Regulations by viewing our other related content resources. Or schedule a 1:1 conversation with one of our consultants to discuss this topic more and receive a personalized demo of our software. Editor's Note: This article was originally published by Florian Tolkmitt on Medium and is being republished here with permission. 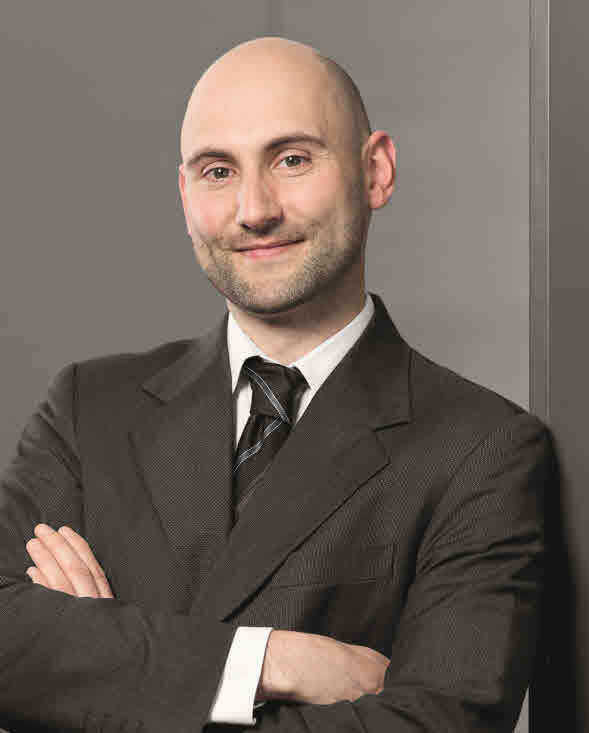 Florian is founder of a clinical evaluation marketplace for authors and medical device manufacturers called Clinical-Evaluation.Report. He has a background in medical device development and regulatory affairs and worked for Medical Device Consultancies and in industry before he decided to help manufacturers as a Freelance Consultant.